The high winds blow the snowflakes into my face, and the stinging feeling in my eyes forces me to look down as I continue to walk forward. I remove the snow that has gathered in the lens hood on my Nikon 200-500mm and, with my binoculars, I search the landscape in front of me. Nothing to see. Not a single mountain hare. I am in a total whiteout of blowing snow, and it's only because of the more clear and calm weather of a few hours ago that I’m aware of the the beauty of this Scottish landscape I am surrounded by here in the heart of the Cairngorms National park. My name is Morten Hilmer and I am a full time professional wildlife photographer and former special force soldier in the Arctic Dogsled unit - the Sirius Dogsled Patrol. I am specialized in photographing in the Arctic regions and since 2005 I have spent more than 4 years in the amazing high Arctic nature. (You can read more about my time in the Sirius Dog Sled Patrol on the BBC Earth website). 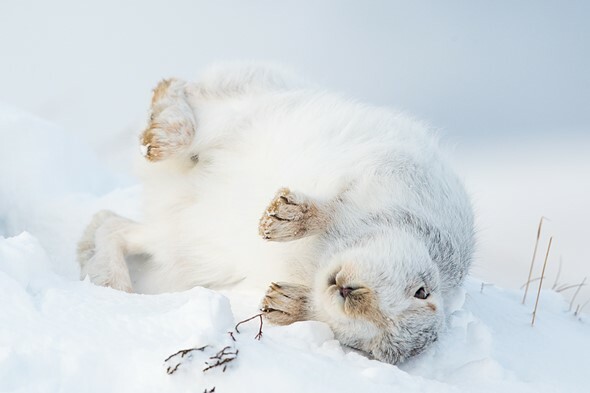 Beside the many publications, my photographs have been awarded in the Wildlife photographer of the year and European Wildlife Photographer of the Year photo competitions. And in Spring 2017, I published my first book: Silence of the North. Wildlife photography for me is all about fascination, getting close to nature, feeling its authenticity, and sometimes even feeling reunited. Through my work, it is my mission to share my fascination and raise awareness of the importance of taking care of this awesome planet and all creatures living on it. Nature Photography is also about adventures—whether the adventure is an expedition to the desolated freezing ice desert of North Greenland, or a shorter trip to the local forest. For me one is never better than the other. A short break in the snowfall gives me just enough visibility to skim the landscape in front of me and just enough time to get a glimpse of a movement about 50 meters in front of me. I kneel down to support my arm on my knee to keep the binocular more steady. It is the the mountain hare. Instantly I feel excited and extremely lucky. Slowly, I walk closer while concentrating on the hare and keeping my movements as slow and invisible as possible—I don’t want to scare this little guy. Not only will it destroy my opportunity to get some good shots, but more importantly, it will disturb this little hare that already has a hard time finding enough food to get through the winter. I am now quite close and I decide to leave my camera bag behind to make it easier to crawl the last distance. I grab an extra battery and my card holder, and get my vlogging camera ready with the microphone. I fell the need to share this moment, even though it adds another challenging element that I have to record myself at the same time as I am working. For a trip like this, I need to be able to cary everything on my back, which means all of my equipment has to fit into one Lowepro Pro trekker 600 AW. Therefore, I decided to leave my big Nikon 600mm F4 at home and instead bring the smaller, lighter and more flexible Nikon 200-500mm. As for the camera, I am using my Nikon D5—primary because of its durability in cold, wet conditions like this one. I was tempted to bring the D850 because of the superb image quality, but I have had a few moisture problems when I've really challenged it with snow and heavy rain. I have also brought the Nikon 16-35mm VR and, of course, some extra batteries, cards, cleaning equipment etc. As for my vlogging camera, I am currently using a Panasonic GH5 with the Røde Videomicro and the 42.5mm and 12mm Leica lenses. I charge the batteries for this camera with power banks. If you want to dive deeper into my equipment, I explain it in a little more depth in this video. Everything is ready and I move a little bit closer. 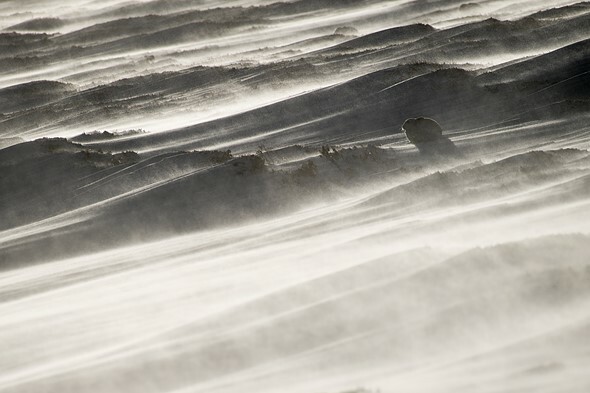 Through the viewfinder, I can sometimes see the hare and sometimes it disappears, hidden by the blowing snow. I find myself using almost the exact same camera setup and setting whenever I capture wildlife photography, regardless of which camera and brand I am using. I primary shoot with Nikon, but I have also worked with the Canon 1D X Mark II, the Canon 5D Mark IV, and the Sony A7S. My camera is set to manual exposure, and because of the constantly changing light I turn on auto ISO. I use this setting because I want to be able to set both the aperture and shutter speed myself to get the perfect level of blurred background, and at the same time use the shutter speed that gives me the exact level of movement in the blowing snow that I want. This way, I get the best from both the worlds of aperture and shutter priority programs, allowing only the ISO to be the variable factor. Yes, I do run the risk of noise, but I always keep and eye on how high the ISO goes as I shoot. I set my AF to 3D, and assign the function button on the front to single point AF—I am ready. It is interesting how looking into the viewfinder can make everything else around me disappear. I reckon all photographers know this feeling. Only me and the little hare—nothing else exists. I watch how he sits there in his little snow bed and, only every now-and-then, he moves a little bit. I don’t dare to take my eyes from the viewfinder. 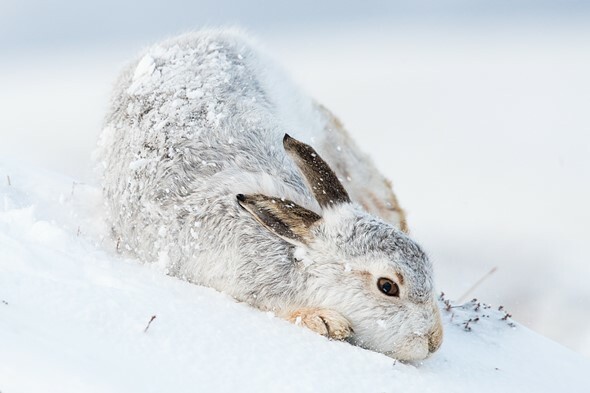 Suddenly, the hare raises and stretches his long leg and then, without warning, he rolls around in the snow. The time he gives me to react is too short but what did I expect—this is what us wildlife photographers have to deal with all the time, and I assume it's also one of the things that makes us keep going out again and again... all these photos that we have seen but haven’t been able to capture. I manage to get a few shots of the rolling hare, but already before I look at them, I know they are not totally in focus. This is fantastic—so intense. The little fellow sits for a moment looking at me and I pray that he will not run away. He decides to stay. He starts eating the sparse vegetation and with his small paws he scrapes away the snow on top. I don’t know for how long I have been here, but it is getting quite dark and I am getting colder laying in the snow. My thoughts starts to travel to the side pocket of my backpack where I keep my thermal with warm coffee. As I walk down the mountain I think about this little hare who is still sitting up there on the mountain in the blizzard, patiently waiting for the Spring. It is so fascinating how they manage to survive in such conditions. It is my first time photographing wildlife in Scotland, but definitely not the last. It has been an absolutely fantastic experience to spend some time with the hares in highlands of this amazing country and tomorrow I am going further up north to find and hopefully photograph the impressive stags. One of the most important things for me is that I want to have my left hand on the lens— at the ready to zoom in or out, and to take over manually when autofocus fails. Therefore, I always set one of the custom buttons to preview the image, and another to zoom the image 100%. I like to have the preview button as the lowest function button on the front of the camera, so that I can press it with one of my fingers without having to move my index finger from the shutter and the thumb from my AF-lock button. Before I start photographing, I alway choose the autofocus method that I believe will do the best job. In my case, it is often the 3D AF on the Nikon D5—either that, or single point AF. Then I try to predict which other AF method I will need, and I set the top button on the front of the camera to use this method as long as it's pressed. Because of the option of doing exposure compensation in manual mode with auto ISO on, I use either this setting or full manual almost all the time. I call Manual with Auto ISO: MAI. To be able to make a quick switch between M and MAI, I setup one of the custom buttons near the release button to toggle Auto ISO on/off. In November 2017, I started a new video project that takes other photographers and nature enthusiasts behind the scenes on my travels. In a series of 4k YouTube videos, I share my experiences from my trips and expeditions around the world. Morten Hilmer is a professional wildlife photographer and former Danish special forces soldier in the Sirius Dog Sled Patrol, an Arctic dog sled unit. For the past 13 years, he's specialized in capturing Arctic landscapes and wildlife. You can find more of his work on his website, or by following him on Instagram and Facebook. Thanks for sharing. Amazing how close you managed to get close to this little white fellow ! Very good article, thanks for it. Excellent article. So well written and I was right there with you. I have not had a chance to view the videos as I read the article in an open plan office. Your images are breathtaking. Some great advice on technique. I would buy books of your work for sure. Thank you for writing and sharing this...you seriously inspire me as a photographer. I love that he kept the images true instead of over doing them in post. Really helps keep the mood! PS. Morten, if you read this. There is a GH5 focus fix on youtube :D also, I love all of your vids how you bring us into the environment with you. Crave this style of adventure! I really enjoyed your video. Besides the amazing hares, your description of your techniques, and composition were very helpful. For most of us, being that close to a Scottish hare would have us shooting wildly, filling our SD Cards. But your description of the changing light, foreground, and background, brought it back to solid technique and practical elements. Thanks..
An outstanding article with fantastic images and delightful videos! One of the most impressive experience about what the essence of wildlife shooting is! 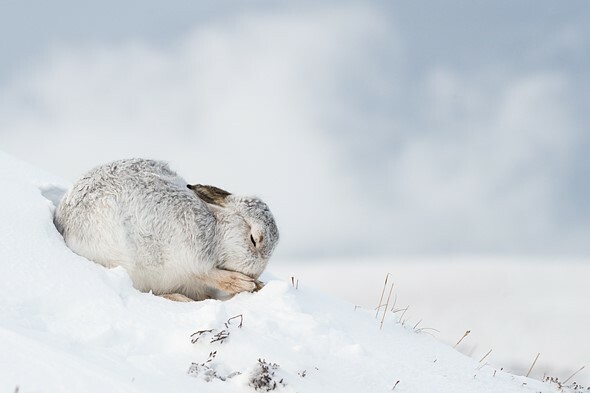 Just spent an enjoyable half hour or so watching your two videos on Scottish mountain hares, absolutely amazing and I was left totally enthralled by both your photography and enthusiasm for your subject. I spent some time there photographing hares and one little chap let me get to about 3metres from him, such a great little character ( obviously knew that if I presented a danger he could run up the hill faster than me). I also enjoyed your video on the musk oxen as well. Great stuff!!. Good post (liked). Hares can actually run faster uphill than downhill because of the difference in length of the front legs and back legs. Apparently that is the same with Haggis only with them it’s the left legs. Thank you for sharing your experience with the excellent and inspiring video ! Patience and luck finally paid off with these beautiful images in such extreme environment. The backlighted images (near the end of the second video) are my favorite. Once again, thank you. These are the best videos I've ever seen for conveying both the reality, and emotion of wildlife and nature photography in practise. 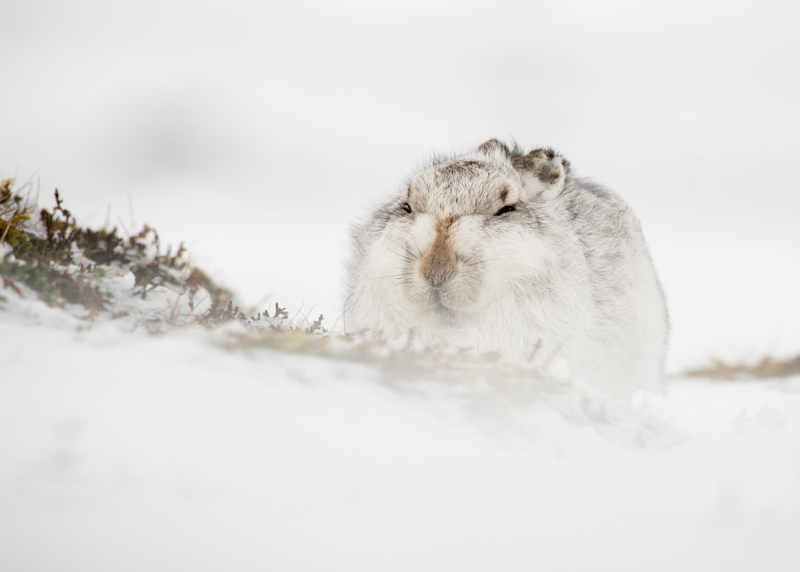 I've just been up to the same part of the world (exact same location) and managed to photograph mountain hares for the first time too, a few weeks after your trip by the looks of it. Your fantastic set of images reveal so much about the hares and I really enjoyed the article and videos. Marvelous article, and fantastic images! I just remember the story of some of your predecessors that - allegedly - sent a message to the first moon landing crew, saying, paraphrased, "Congratulations, now *we* are not the most lonely people, anymore"
What? No cat or dog pic? No wildlife is complete w/o those. At least a mountain lion & a wolf. LOL! Kidding aside, I do enjoy this series. Thank you. It is wonderful. I wish I could go to the Arctic & Antarctica someday. For many, it is a once in a lifetime adventure. Thanks a lot Silentstorm. You should definitely go to Greenland - actually it is not so expensive anymore and it is easy to live and get around up there. I can recommend ilulissat on the west coast. BTW any aurora in Greenland? Is it seasonal? "The reason I am doing these new landscapes, this new Roman project, is because it’s a form of healing. I’m kind of healing myself. " "I went to war because I felt I was suited to do it. I was young and ambitious, but the ambition started to fade ..... Things the average man in the street simply wouldn’t understand, because he’s never been there, thank God." 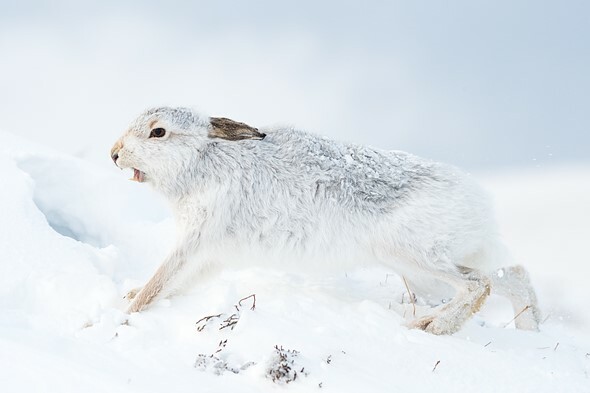 I adore these Hare photographs. Auto ISO in M mode is also my preferable wait to shoot in many occasions, especially if the system allows to use exposure compensation by shifting the iso value. It gives you more immediate control over aperture and shutter speed then any of the other modes, more control over the 'brightness' you want to achieve too. It is reasonably well implemented on recent cameras from Sony, Nikon and Canon but Panasonic and Olympus are still lagging behind in this regard on their lower-tear models or most of their models if I am not mistaken. Panasonic GH5 is amongst first micro 4/3 cameras to rectify this long lasting omission, if I remember this correctly. Or was it maybe GX8 or Pen? Great feature. Amazing photos. One of my favorite subjects: the rabbit/hare family in general (aka lagomorphs). This is one of those situations where one can understand why a pro body like the Nikon D5 is needed, and where the camera more than justifies its high price tag. Morten: Thank you so much for replying to me! I am truly honored. You are not only a great photographer, but obviously a great naturalist / environmentalist/ human being. My favourite article in a while. You have what we say in Danish " et levende sprog". That including the pictures makes me feel like I'm right there with you in the mountains in the cold. Great job with both the article and pictures. Would love to attend one of your lectures. So cute. 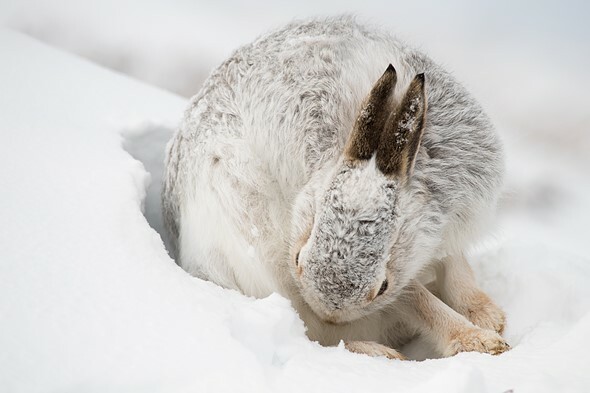 Are they the same as snow hares? Thanks:) No not exactly but close. 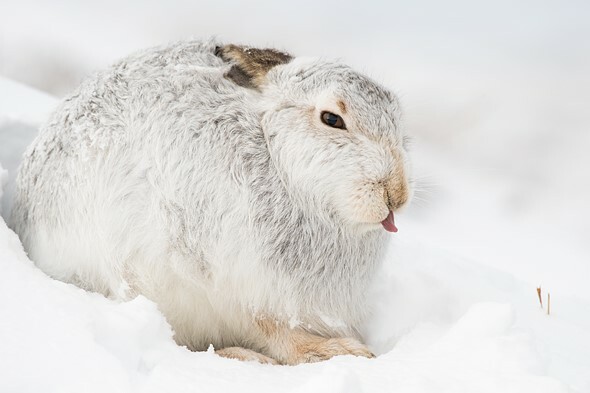 This is the Scottish Mountain hare. Very interesting - I like how the gear and technical discussion was in the context of "getting the shot". That's how it should be. Definitely one of the better articles on dpreview. All shots taken with a 42.5mm lens mounted on a GH5? The rabbits appear to be so close. And one lying on its side, as if daring any hawk that happens to be about. Were they rather tame? One would think that, for fear of predators, they would avoid open spaces and be difficult to approach. Also, being camouflaged, they might see before they are seen. Their big ears might also pick up the voice of the vlogger. Or are they too hare-brained? The gh5 was the camera he used for vlogging, not the camera he used for shooting the rabbits.
" Therefore, I decided to leave my big Nikon 600mm F4 at home and instead bring the smaller, lighter and more flexible Nikon 200-500mm. As for the camera, I am using my Nikon D5—primary because of its durability in cold...."
Neat to see you featured on DPR Morten. I've watched all of your videos. They're all so inspiring but I think your most recent videos have been your best by a significant margin - I don't know if you're getting better at editing them or you're more comfortable, but your combination of "action" photography, telling us what you're doing, and then the final shots you show make excellent videos. Next up - that close to polar bears or grizzly bears, right? Jihaaa - that is such a nice comment to get FuhTeng. I really hope I can keep it up;) Now you have higher expectations;) Just wait and see - something new is coming up - probably on Friday.. Very interesting article. Lots of interesting tidbits re equipment. Your personal thoughts about shooting while in nature, and nice details about the process of shooting wildlife. ". . . this is what us wildlife photographers have to deal with all the time, . . . "
It should be "we wildlife..." instead of "us wildlife..."
You’re a former English teacher yet found only one grammatical error? Thanks a lot santamonica812 for pointing this out. I try to get better at English since it is not my first language and I really appreciate rules like this one, that makes it easier for me to write in the future. Very kind of you to take your time to explain. And thank you for your compliment to the videos - so encouraging. Great article. Discussion of gear, techniques, settings and nature. Something to satisfy even the most jaded DPR reader (or maybe not?). Anyway, I enjoyed reading this post and will check out the videos when I have time. Any who doesn't love furry little rabbits...always brings "Watership Down" to mind. Love the photos too, Thanks for posting this! Well, I like any post that makes me think of "Watership Down" . . . one of my favorite childhood books. It takes immense courage to document a marginal creature's living. Love it, no death and decay, just fluffy white bunnies. Are these hares active during the day? Our similar species (Snowshoe) are quite nocturnal. From my experience showshoes are also active during the morning/evening when there is still good light out and I commonly see them a few hours before sunset. Very nice article and great images. Thanks. Real photographer, using real cameras and lenses. Beautiful work Morten, really! it's funny when I was watching your video I thought ... how come is that you don't look worried about getting lost in that immensity, you never show any concern about not being able to go back to your SUV or losing your way back Then I read that you were in the military and I realize that getting lost was probably your last concern. You have a method or tips that you can share about not getting lost in the wild? I will love if you can do a short video about it. I like to adventure myself in some semi-wild places ... but for some reason, I'm sometimes worried about this topic. Great work again ... keep sharing this videos with the community. Getting lost in the mountains when the weather suddenly changes is a serious concern and thanks for suggesting a video about it. That is in my to-do book. 1. I always use my GPS so that I know where my tent / car / track is. It takes a little discipline to make these important waypoint when the weather is nice and calm and the sky is blue, but things can change very fast in the mountains and these positions can come very very useful. 2. I always have a compass and a map as a backup, because unlike the GPS this manual way doesn't need batteries and can "almost" not break. Maybe it is just me being a little old fashioned but it makes me feel safe. 3. When I have to travel over longer distances I always either bring my tent and camp stuff. In this way I will never get in a dangerous situration because if worst come to worst and the storm kicks in, I can raise my tent. I laughed when you stated that the military doesn't get lost and remembered "The Lost Patrol". Even with GPS (battery failure), cold has a way of making irrational decisions seem plausible. A compass is still the fall back. great story, Videos and nice pictures, I am interested in the clothes you use out there. Is it really warm? I hate the winter and the cold, but I also want to take pictures in the winter, so I look for warm clothes. What gloves are these? Any hints for me? Thanks a lot for a nice compliment. Soon I will make a video about my expedition equipment and clothes but for now, I can tell you that I am using merino wool as the inner layer. Some kind of thick merino wool or fleece as the mid layer and then a cotton jacket when I am working/moving and a thick light down jacket, when I am sitting still. For the boots I am always using 2-3 numbers (european) bigger than normal. For instance: I am normally a 46 but my expedition boots are 49. That gives room for very thick socks and still leave extra room. Wouldn’t a sleeping mat be usefull when lying on the Snow? thank you for the answers and hints. Thank you DPR for covering the work of what I consider a "REAL PHOTOGRAPHER". I wish I had only half his passion ! Do scan the BBC website too. The arctic fox (Vulpes lagopus) capture jumping across the ice is very impressive! Thanks a lot Martin - I'm very glad you like my work. The photos seem great, but on my PC they look really compressed and full of artifacts :( It's such a shame, because I'm quite sure that Morten's original files look nothing like what I'm seeing. I'm a little disappointed that the BBC couldn't do a better job. Excellent stand-out imagery. Very dedicated. Very focused. Very disciplined. Following the YouTube channel as well- Hilmer's narration and the scenery makes you feel the Arctic winter in the tropical heat. Great images, I live these mammals.